Accusations of hypocrisy have rained down on the couple that heads Spain’s far-left Podemos party for buying a 600,000-euro luxury home with a swimming pool after previously condemning such extravagance. The purchase caused unease among the rank and file of Podemos, which was formed in 2014 to represent “the people” against “the caste” — as it called the country’s political and business elites — and there are fears it could cost the party at the ballot box. The controversy led Podemos leader Pablo Iglesias and his partner, the party’s parliamentary spokeswoman Irene Montero, to call a grassroots vote over their leadership. The party’s nearly 500,000 members will vote from Tuesday until Sunday to decide whether the couple should stay on. The results will be announced on Monday. The couple have confirmed they took out a 30-year, €540,000 mortgage for the property in Galapagar near Madrid after the press revealed the purchase earlier this month. Pablo Iglesias e Irene Montero silencian las críticas a su chalet en Podemos https://t.co/TSMCacaDNp via @elmundoes Pour ceux qui voudraient se faire une idée sur la modeste masure achetée par les potes de Mélenchon. Quand on est d’extrême gauche, il faut au moins ça, non ? They justified the purchase by saying they wanted to have “a bit of intimacy” to raise the twins they are expecting. En realidad, Pablo e Irene ingresan un pastizal al mes. Pueden pagar la hipoteca. Y el mantenimiento del chalé. Y el servicio. Y todo. “We understand that many Spanish families, even with two salaries, can’t afford a mortgage like this. That’s why we think it’s so important to defend dignified salaries for everyone,” the couple said on Facebook. They received the support of far-left European leaders such as Greece’s former finance minister Yanis Varoufakis and France’s Jean-Luc Mélenchon even as conservative media delighted in the controversy. Varoufakis, who was criticised himself after posing dining in style on the roof terrace of his Athens apartment for photos in the glossy French magazine Paris Match, told AFP it was “quaint if not ridiculous” to think that those who fight against inequality “must live in slums”. But Iglesias’ past statements against politicians who “live in villas” and “do not know how much a coffee costs” have come back to haunt him. Critics recall that in 2012 he criticised conservative Prime Minister Mariano Rajoy’s then economy minister Luis de Guindos for buying a luxury home. “Would you hand over the nation’s economic policy to someone who spends 600,000 euros on a luxury penthouse?,” Iglesias wrote. The couple has argued their purchase is different because they bought their house to live in, not “speculate” on like de Guindos. Javier Maroto, a top member of Rajoy’s ruling Popular Party, has accused the couple of “laughing at people”. Political scientist Cristina Monge, an expert on the “Indignados” movement against economic inequality that occupied city squares across crisis-hit Spain in 2011 which gave rise to Podemos, said the affair would “mortgage” the party “in terms of credibility and loss of support”. “Podemos tells its voters: ‘We are going to represent you. We are like you, we are from workers’ neighbourhoods, we wear jeans, we ride the metro’,” she told AFP. The furore risks tainting the image of the party a year before municipal, regional and European parliament elections. The couple have also come under criticism for calling the leadership vote. 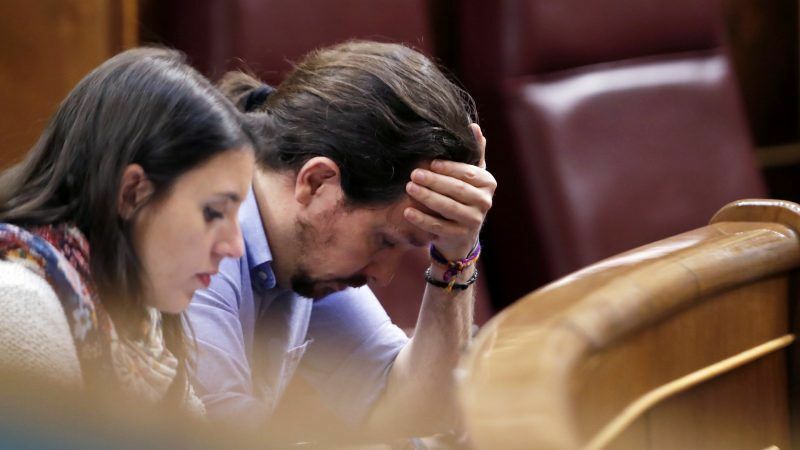 “It bothers me,” said Daniel Ripa, the secretary general of Podemos in the northern region of Asturias, while a party leader in Madrid, Lorena Ruiz-Huerta, said calling the vote was “a mistake”. Podemos has become one of Spain’s four main political parties after winning around a fifth of the vote in the last general election in 2016. In opinion polls it now matches and sometimes overtakes Spain’s traditional leftwing party, the Socialists (PSOE). The scandal “mainly hurts Pablo Iglesias’ image and thus it hurts the electoral potential of the party,” said Antonio Barroso, a political-risk analyst at advisory firm Teneo Intelligence in London. But the party appears not to have any alternative other than to stick to Iglesias and Montero. “If you vote no, you will plunge the party into an enormous crisis a year from elections,” said Monge.